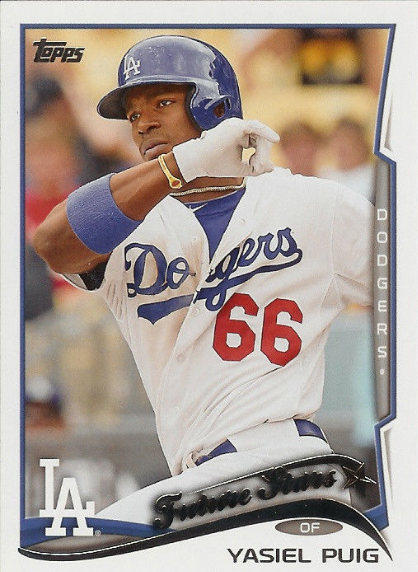 Following up on Friday's post featuring the Dodger base cards found in 2014 Topps Baseball Series 1 packs, I now show you the known short-printed variation cards that can be found. 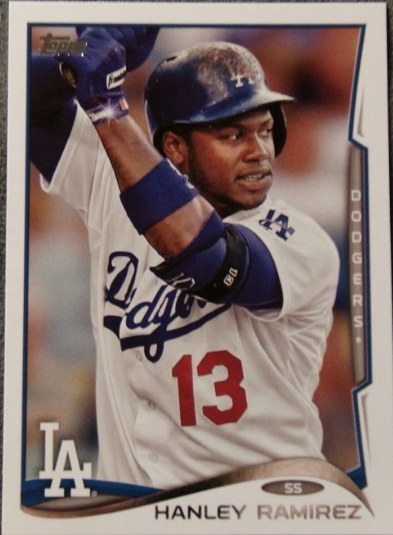 As of this writing there are 11 known Dodger variation cards, and there is a possibility that more may be out there. The set is less than a week old and collectors are still opening packs and discovering new cards. If any more pop up I'll be sure to update this post. 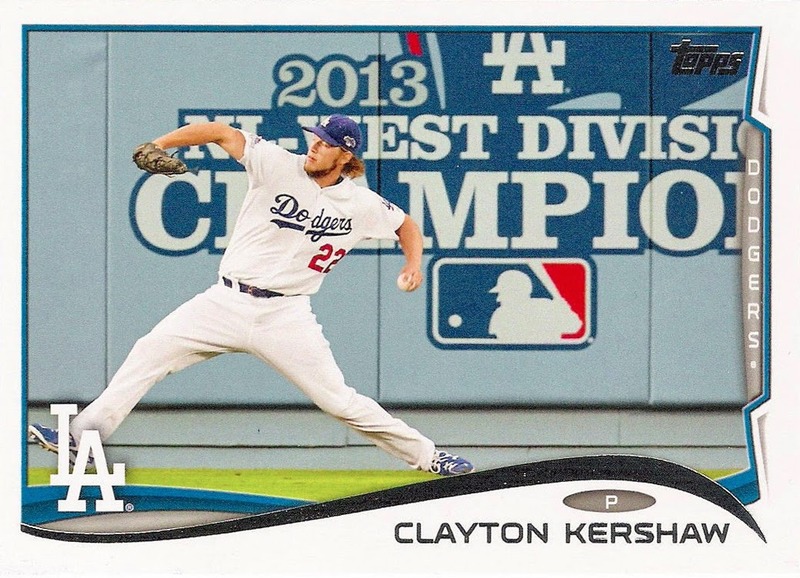 As you can see, Hyun-Jin-Ryu, Adrian Gonzalez, Hanley Ramirez and Clayton Kershaw have two variations available. 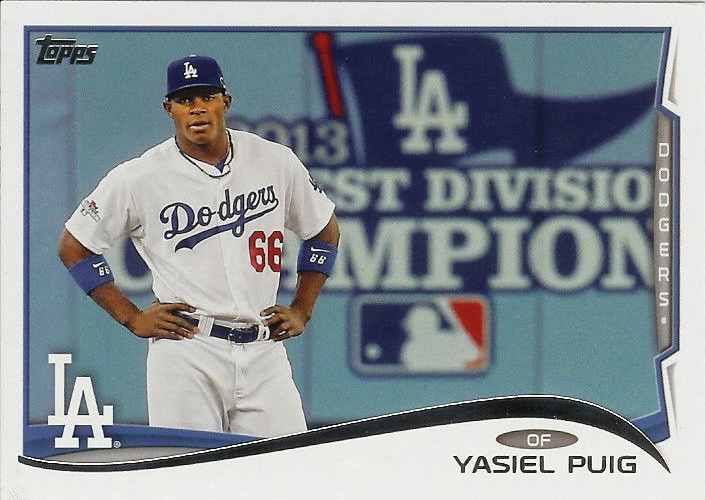 Yasiel Puig has 3 different variations. Current print runs are not yet known. One of the more obscure variations are the "sparkle" cards. 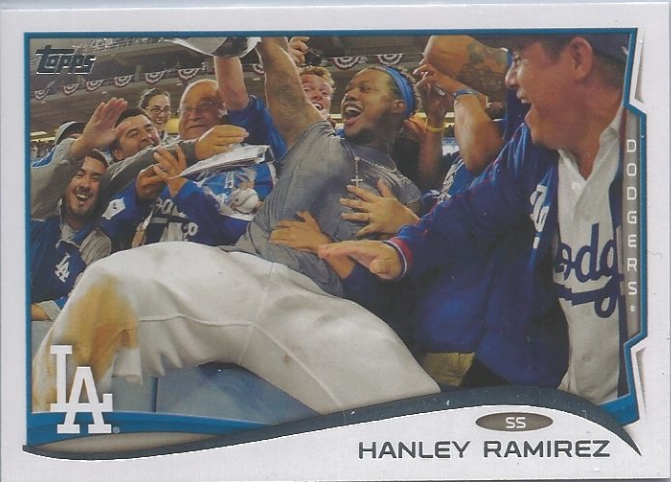 Topps has taken a players base card and hidden a sparkling star somewhere in the photo. 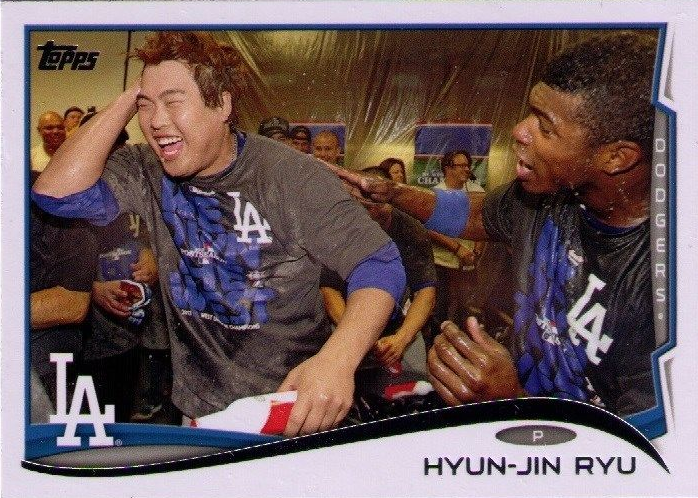 For instance, on the Ryu card a "Sparkle" can be found at the point where the brim of his hat and the Baseball in his hand meet. 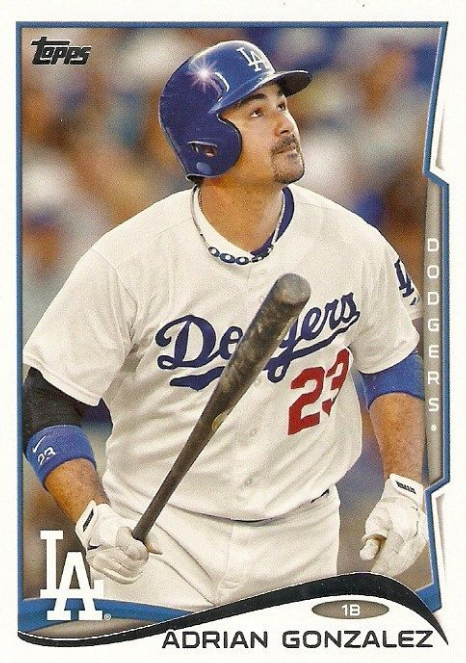 Four Dodger cards have a "Sparkle" variation. 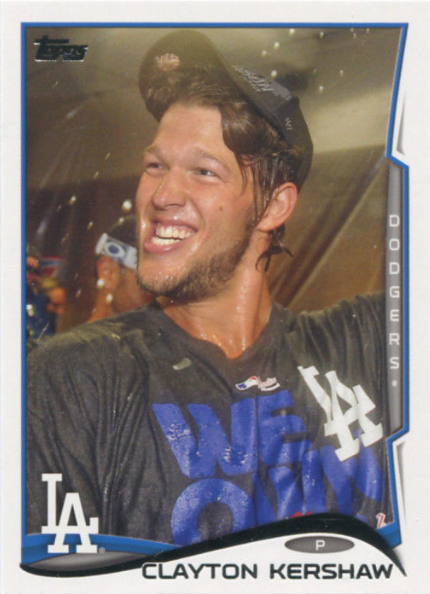 At this time, a Clayton Kershaw "Sparkle" is not know to exist, but stay tuned. I suspect this variation exist somewhere. I can't believe I hadn't run into this before. 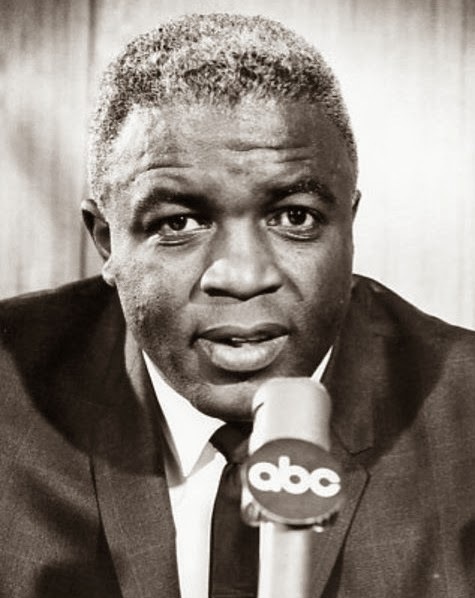 Jackie Robinson used to host a radio show called 'Jackie Robinson's Radio Shots', and what looks like a complete archive of its recordings are available for everyone to hear. I couldn't find much information about the show itself, so I have no idea what network it was on. From what I can tell, it started in the late 1950's, and likely ran for a few years. The broadcast was about 4 1/2 minutes long; including a local intro, outro and commercials. The interview,s themselves, were edited to be about 3 minutes long. Jackie would interview all kinds of different folks; from an US Army General to Satchel Paige. Fortunately, a couple of folks took some of the original recordings and put it on YouTube. Check some of those out below. Also, the Old Time Radio Researchers Group (OTRRG) has a website that has 90 episodes available for free download and listening. Go here to their website. I spent all weekend listening to each one. My favorites were his interviews with Don Drysdale, Ed Sullivan, Satchel Paige, Al Schacht and his editorial on the art of stealing home. Wow! This is why the Internet is so great. There is so much stuff out there to discover. Jackie speaks with golfer Tommy Armour. Pic at the very top via Wikimedia Commons-public domain photograph. Saturday was the 2nd Annual Dodger FanFest, and it was wonderful. There was plenty of space, a lot of activities, and few of the horrid lines that plagued last years event. I give the Dodgers group a solid A+ for paying close attention to last years debacle and improving nearly every aspect of the event. Dodgers photographer Juan Ocampo has a whole slew of photos from FanFest available for viewing, here. Jon Weisman at Dodger Insider shares various tweets from FanFest, here. Ken Gurnick at MLB.com writes, "Scully, FanFest crowd excited over Dodgers". Jason Drantch at Feelin' Kinda Blue shares his thoughts about FanFest. The Sons of Steve Garvey shares some great pics from Killeen at FanFest. Dodger Penguin shares his day at FanFest. 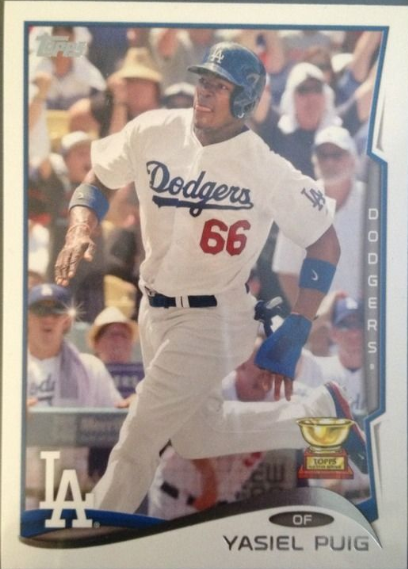 BTW, Dodger Penguin is running a contest for a free Pepe Yniguez autograph that he got there. Go here to check that out. Ron Cervenka at Think Blue LA shares his photos from FanFest. David's Autograph Signings shares his busy day of autograph hunting at FanFest. True to the Blue provides a nice recap of his day at FanFest. Chris Long at SoCal Autograph Odysses recaps FanFest, too. Roger Arrieta at Dodgers Beat shares his own recap of FanFest. RJ at RBI Collecting shares some of his autograph gets. 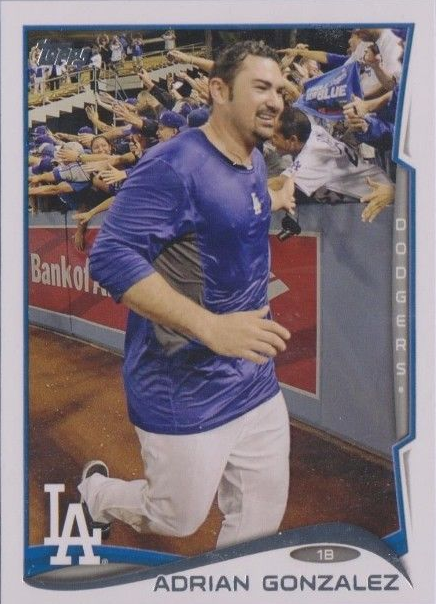 Blue Heaven reader Austin shares his Tommy Lasorda rookie card that he got autographed at FanFest, here. It was a great pleasure to meet you Austin! FanFest was held in Lots B & P; which are located adjacent to the stadium at the Top deck and left field reserve entrances. It provided plenty of room to roam around and not feel crowded. Also, the system of selling tickets (for charity) for player autographs was a great decision. It removed all of the anger and confusion that hampered last years FanFest. Furthermore, it's obvious they reduced the number of autograph vouchers available. Autographed sessions were slated to last 50 minutes, but each player finished up in far less time that that. I got to Dodger Stadium bright and early, and waited in the line of cars at the Sunset entrance. When they finally opened the gate it was a mad rush to get in. 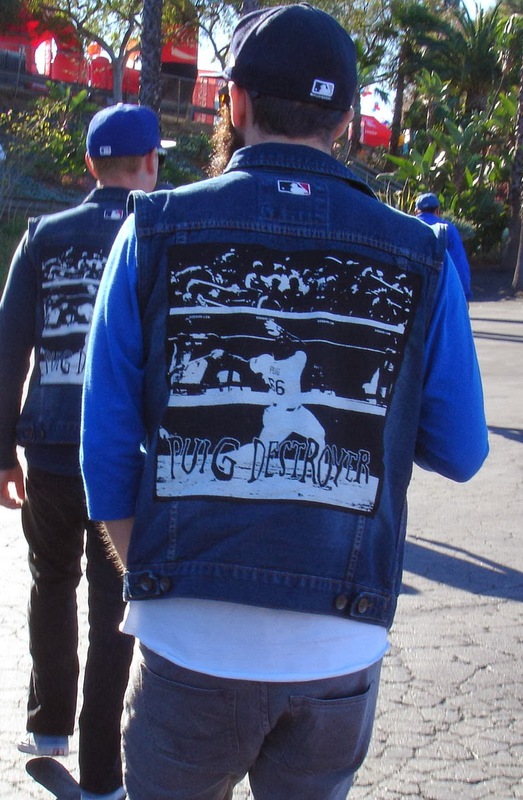 One of the first things I saw when walking to FanFest was a group of 3 fellows sporting Puig Destroyer jackets. See it above. Unfortunately, I didn't stop them to ask about the jackets, but I'm certain others did. As soon as I track those interviews down I'll be sure to point you there. Below is a look at some of the booths and activities inside. Click on any pic to embiggen. Below is the booth for the Mystery Bags. They were selling autographed baseballs, photos and jersey uniforms for $20, $20 and $40, respectively. I didn't purchase a bag myself, but I saw folks getting autographs of players like Olmedo "the Killer Tomato" Saenz and Mariano Duncan. I also saw a couple of St. Patrick's Day autographed jerseys in the jersey mystery bags; which I thought was cool. And the Dodgers Jr. Broadcasters were in the house. Go here for information about the Dodgers Jr. Fan Club. There was a booth with a bunch of Dodgers memorabilia for sale; including the below Clayton Kershaw and Vin Scully signed items. They also opened up the stadium so folks could roam around. As you can see, they are just starting to fix up the field after last weekends Stadium Series game. Also, construction is well underway in the outfield pavilion areas. Last weekend those buildings didn't exist. I also ran into one of the new Dodger broadcasters preparing to film something. Below is Alanna Rizzo. The Dodger fire truck in Lot P.
I went to view the Dodger field from the Top Deck and realized that I could see into the media tent between the autograph area and the interview stage. Players were greeting each other like they were long lost friends. Tommy Lasorda is being interviewed below. Above, you can see Brian Wilson being interviewed, as well. Below are a handful of photos of some Dodgers speaking from the interview stage. Below, Ned Colletti let us all know that the arbitration case with AJ Ellis has closed. AJ has signed a new 1-year contract. Below, Yasiel Puig is speaking to the crowd. Finally, I get to the autograph lines. Check out those photos below. 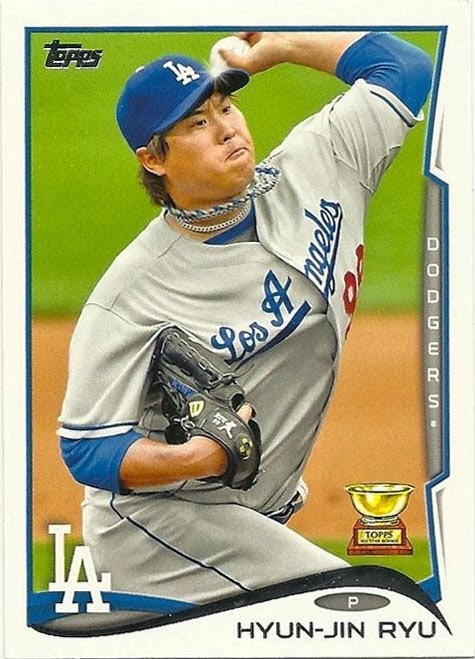 I was able to get vouchers for Dan Haren, Mickey Hatcher, Justin Sellers, Orel Hershiser, Ned Colletti and Hyun-Jin Ryu. Check out photos of them below. I was also able to capture photos of a few other Dodgers while waiting in line; including Nomar Garciaparra below. Above left is Dan Haren. Above right is Mickey Hatcher. Below left is Tommy Lasorda. Below right is Tim Wallach and Shawn Green. Matt Kemp and Orel Hershiser. And here are my autographed Baseballs.